Streams are created when excess water from rain, snowmelt, or near-surface groundwater accumulates on the ground surface and begins to run downhill. This excess water from rain or snowmelt generally occurs when the water accumulates at a faster rate than the soil and organic matter (e.g., dead and decaying vegetation) can absorb the water, plants can use it, or the water can be evaporated into the air. Groundwater also may create a stream, or may add to its flow. For example, water may emerge from the ground as a spring , forming the headwaters of a stream. Farther downslope, shallow groundwater adjacent to a stream (e.g., in adjoining streambanks) or beneath the streambed also may contribute water to the stream. As the smaller streams join one another, the accumulated water's quantity and velocity increase, and the water begins to cut into Earth's surface, creating its own pathway. With time and differing flows, the stream modifies its pathway. This may cause problems for people who have assumed that the stream will keep to its original path. But the stream plays a balancing act among the volume of water it carries, the amount of sediment available, and the ground it must traverse. The volume of water in a stream moving downslope at a given time, known as streamflow or stream discharge, is a combination of surface-water runoff and baseflow. Streamflow varies as these component amounts vary. When the ground becomes saturated (either from rainfall or snowmelt), some of the water runs off the surface as saturated overland flow. This usually occurs as a result of rainstorms or high spring snowmelt when the available water exceeds the soil's infiltration rate. Surface runoff also can occur when precipitation encounters relatively impermeable surfaces, such as hardened soils, surficial bedrock, or human-made structures such as pavement or buildings. Surface runoff enters a stream more rapidly than does groundwater, and produces a more noticeable response in streamflow (see figure on page 126). 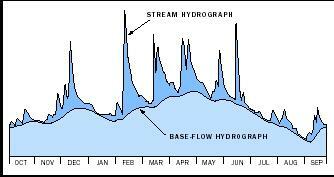 A typical stream hydrograph illustrates the response of the stream to rainfall events: stream discharge peaks following heavy rainfall, then subsides quickly during dry weather. In contrast, baseflow (the amount of streamflow provided by groundwater) responds more gradually. In this example, groundwater accounts for more than half of the stream's annual flow. peaks in the spring or early summer, and causes streamflows to increase and decrease gradually, over days or weeks. Flow response from a rainfall event is faster, and can even be observed within hours (or less) in small basins and in basins with a low degree of permeability. Rainfall and snowmelt soak into the ground, where part of the water is then held by the soil. But beyond a certain point, known as saturation, the soil begins transmitting the water it receives through the soil and rock below. When these deeper geologic materials are saturated, the water carried in these deeper geologic materials is called groundwater. Groundwater can move through geologic materials in response to gravity or other external forces. Where this underground water naturally intersects the land surface, it can directly or indirectly add water to an existing stream or lake. Where it contributes water to a river or stream, it is called baseflow. This water movement, sometimes over a long distance as groundwater, is generally a slow process, but can provide a steady supply of water to a stream. On average, groundwater supplies 30 to 40 percent of the water that flows in streams; but of course this amount will vary widely from stream to stream and across different geographic regions. As water flows over a surface, the surface creates some resistance, and water closest to the ground is slowed. As the depth of the water deepens, this slowing near the ground and increasing away from the streambed becomes more noticeable. Measurements made in a variety of streams shows that velocity increases as the logarithm of the distance from the bottom of the stream channel. Where the soil has enough cohesiveness (either innately or because of root systems) to create walls along the stream's bank, these walls also create some resistance, so the velocity is slowed near the sides of the channel. The overall effect of this slowing at the edges is that the water in the center moves the fastest. Flow in the river is measured as volume per unit of time. The traditional unit of measure in the United States is cubic feet per second (cfs), although measurements today are often in cubic meters per second. To calculate the flow (discharge) of a river at a given point in time, the cross-sectional area of a river is divided into segments of equal width. The depth and average velocity of each segment is then measured. Average velocity is approximately 0.6 of the depth; velocity also can be measured directly by a current (or flow) meter. The width multiplied by the depth and the average velocity of each segment produces the discharge (in volume per time) for that segment. The sum of the discharges of the individual segments is the discharge of the river. Floods occur when a stream flows over its banks. Studies have identified the relationship between flood frequency and volume within a stream channel. Estimates are that a river reaches this "bankfull discharge" once every 1 to 2 years, on average. Flood events, particularly flash floods, often occur as a consequence of a storm with heavy or sustained rainfall. Statistical and mathematical methods have been developed to estimate volume, lag time, and duration of a flood based on the size (magnitude) of a rainfall event. These estimates depend on the characteristics of an individual basin. The lag time between the peak of a storm event and the flood peak is based on drainage basin characteristics such as size, shape, gradient, presence of wetlands or lakes, and amount of impermeable surface (such as concrete and asphalt). The lag time is shorter in smaller, steeper drainages with impermeable surface, and longer in larger basins with forests, wetlands, and lakes. Also, duration of the flood is longer than the storm itself because it takes time for water falling in the basin to flow overland to reach streams and rivers. It also takes time for water in the channel itself to carry this water to the basin's outflow point, such as a confluence with a larger river. When streams are at flood stage, some water moves from the stream into the streambank. Some of this water occurs as bank storage that flows directly back into the stream as its water level drops. If the stream is hydraulically connected to an aquifer, however, a significant amount of the water moves into the aquifer. As the river moves downgradient (downhill), it interacts with its environment, both geologic (i.e., rocks and soil) and organic (such as tree roots and large woody debris). When the stream is shallow and the debris large, the water moves around the obstacles. As the volume of water increases, and the river becomes deeper, it has a greater ability to erode, and begins to cut into the underlying soils and pick up smaller particles. When and where this happens depends on factors like the rock type (lithology), rock or sediment size, and the cohesiveness of the streambank materials (often provided by the root structure of streamside vegetation). Channelization of a river alters its hydrology, sometimes detrimentally. 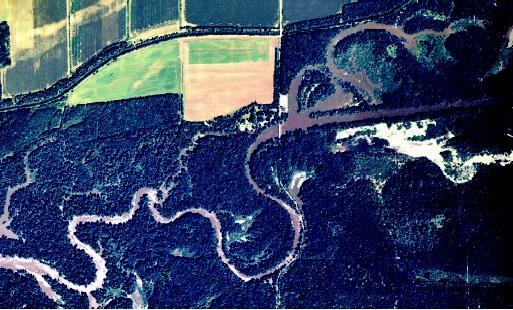 In the 1800s, the once-meandering Kankakee River in Indiana was dredged into a nearly straight ditch (right and middle of photograph) to allow agricultural development. Remnant oxbow cutoffs are visible (middle). An unchannelized segment in Illinois (left) retains its naturally meandering shape. As a river flows over and around obstacles, sometimes picking up materials and other times dropping them, the flow is almost always turbulent. The possible exception is very near the boundaries of a slow-moving river with relatively smooth channel boundaries. Human-induced changes to stream channels can greatly modify the streamflow characteristics. Channelizing or straightening a river by dredging can more efficiently pass flood discharges through the straightened segment, but the faster water velocity can erode more sediment. Restricting a stream within artificial embankments, such as floodwalls, prevents it from naturally meandering, and can create new problems. Any human modifications to stream channels and floodplains should take into account the physics, biology, and ecology of a stream. Recently, increasing interest has been focused on hyporheic flow. This is water that flows beneath and adjacent to the river, interacting with both the water in the stream and the groundwater. The result is an exchange of waters of different characteristics (such as temperature), creating microclimates within the river, and providing extended refuge outside the channel for small organisms, all considered to be part of a larger stream system. The interaction between water and Earth's surface results in some fairly commonly observed stream shapes. * In the mountains, when the water is shallow and the rocks large, the water moves around and over the obstacles. This is termed a cascade. Farther downslope, where sediment is available and water has enough energy to move the sediment through the river system, meanders (curves) may form. This is probably the shape most commonly associated with rivers. Many studies have taken place and many theories developed to try to explain the cause and characteristics of the meander, using mathematics, physics, and theories of conservation of energy. At the end of the system, where drainage is more developed, where sediment supply is high, and/or where the stream has less energy (perhaps as a result of a lower gradient), the river may become braided (intertwined). SEE ALSO Groundwater ; Hydrologic Cycle ; Stream Channel Development ; Stream Erosion and Landscape Development ; Stream, Hyporheic Zone of a.
Rantz, S. E. et al. Measurement and Computation of Streamflow. U.S. Geological Survey Water-Supply Paper 2175 (1982). Perennial, or year-round, streams are common in humid areas where groundwater and surface-water systems are naturally and hydraulically connected. Because groundwater supplies some water to these streams, they keep flowing, although at a reduced rate, even when it is not raining. In arid regions, perennial streams are less common because groundwater generally is deep and not directly connected to streamflow. In these areas, intermittent streams dominate, only flowing when significant rainfall occurs. * See "Stream Channel Development" for a photograph of a dendritic drainage pattern. * See "Stream Channel Development" for photographs of common stream shapes. want to know some of the equations for the study of lag time and time of concentration ,and how to calculate the flood crest of the dry valleys for the purpose of calculating the rate of risk to this valleys.